Of the Kitten Kind: Rice Balls in Rich Tomato Sauce. 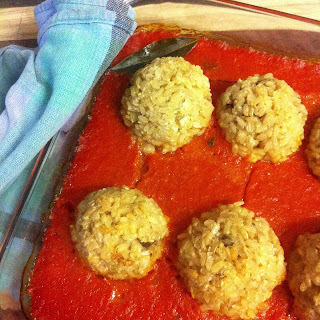 Rice Balls in Rich Tomato Sauce. On Sunday, we went to the Torrens Island markets. Tomatoes are currently $2 a box. Bargain! I've just made a large pot of Italian style tomato sauce. It's rich, thick and delicious with surprisingly only a few ingredients. For dinner we had rice balls that I filled with mushroom pate, but you can fill them with whatever you like. It seems like it's all a little complicated, but when it gets down to it, you don't have to spend much time actually cooking. Most of the time is spent watching the ingredients cook and letting the beautiful aromas fill your gorgeous house. Time: 10 minutes prep for the sauce, 45 minutes cooking. Makes: About a litre and a half (6 cups). Half a teaspoon of sugar or stevia. Place the oil in a saucepan and heat over medium to high heat. Add the onions and garlic and fry for a few minutes. Add the other ingredients and bring to the boil. Reduce heat and simmer with the lid on for about 45 minutes. Let cool and remove the bay leaf. Pour the ingredients into a blender and blend until smooth. I do this to avoid having to remove the tomato skin beforehand. Time: 15 minutes to cook the rice. Five minutes to roll. One cup of brown rice. One teaspoon of vegetable seasoning. Filling of your choice. I used mushroom pate, but you could use a nut cheese or well... anything. Half a cup of flour. You know how to cook rice, right? Do it. Place the rice in a saucepan with the water and bring to the boil. Reduce the heat and simmer for about 15-20 minutes. Drain. Allow to cool. Place the rice in a bowl and stir in the vegetable seasoning and flour. 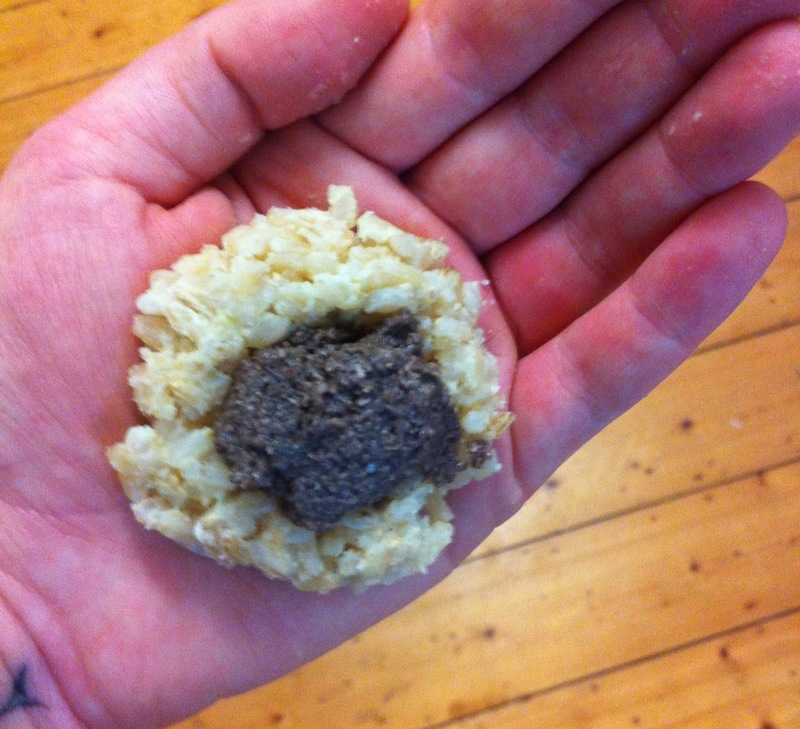 Take a small scoop of rice and place it in the palm of your hand to make a semi-circle. Press your thumb into the middle. Add about a teaspoon of the filling of your choice. 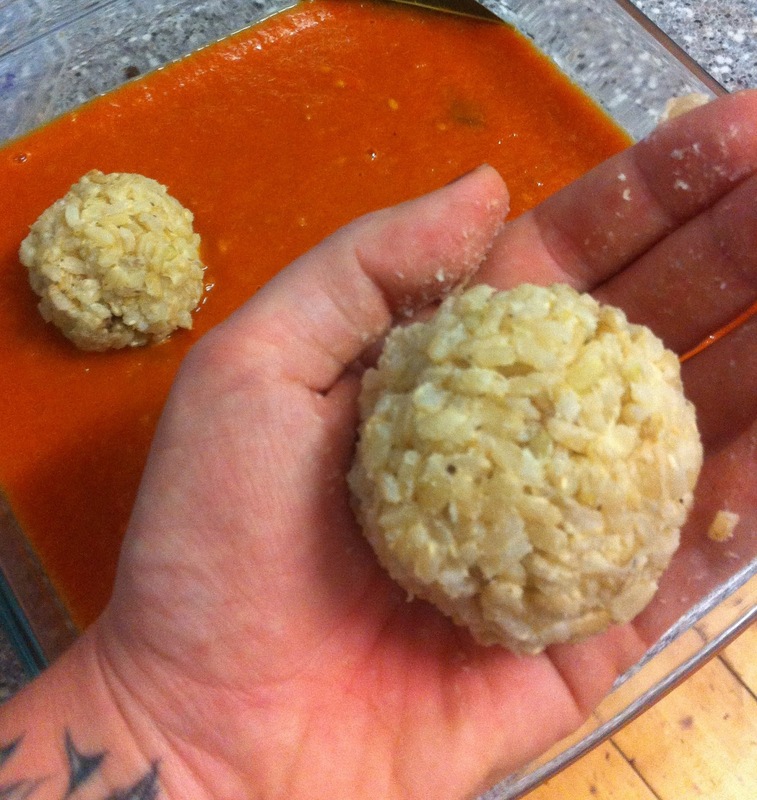 Place another semi-circle of rice on the other side and shape into a ball. Repeat until there is no rice left. Preheat the oven to 200C or 400F. Take a casserole dish and half fill with tomato sauce. Any left over tomato sauce can be frozen until your next pasta dish. Gently place the balls in the sauce and drizzle with a little olive oil. Place in the oven and cook for about 25-30 minutes. The outside will be crispy when they are ready. Enjoy with a gorgeous side salad.